Elevate your current custom wear to the next level by also adding high-quality custom outerwear from One Hour Tees. 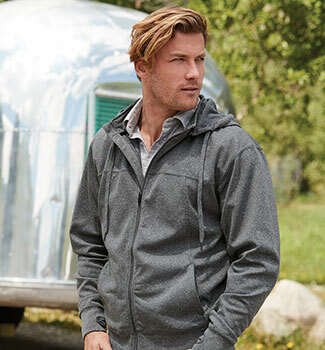 From embroidered caps and beanies to screen printed blankets and ridiculously soft fleece sweaters, the ideal item of outerwear will take your look from standard to stellar in as little as 60 minutes. Not sure what the best piece of apparel is to best complete your custom look? Ask our expert team for advice on what items work best in your budget for any uniform, event, brand, fundraiser, or other occasion. We have hundreds of outerwear options and combinations on many multiple brands. Give us an idea of what you’re looking for, whether it’s still vague or fully realized, and One Hour Tee will create the custom outwear of your dreams. One Hour Tees is committed providing our customers with only products we believe in. No matter the price, if a brand doesn’t fit within our stringent standard, we won’t offer them to our valuable customers. HOW DO WE PRINT OUR OUTERWEAR WEAR? One Hour Tees has multiple printing methods all chosen to best suit our customers’ needs and visions for their custom printed outerwear. As final printed artwork can appear differently depending on printing technique and chosen apparel, we’ll work closely with you to choose the perfect items for your design goals. Gotta have that custom outwear ASAP? Then Direct to Garment or DTG printing might be the perfect option to get it done in no time. Provide us your design and we can have your vibrant, long-lasting custom outerwear ready in as little an hour. Though DTG printing is a great choice for many outerwear products like cotton sweatshirts, it’s not ideal for items like knit beanies, fleece sweaters, or plastics. There is also no minimum order so it’s ideal for small orders. Bright. Bold. Long-Lasting. Screen printing is a great printing option for many outwear apparel items, aside from certain knit or fleece options. Using thick layers of ink, our screen printers apply your custom design in a way that can withstand the elements and always looks absolutely stunning for years to come. Screen printing is a more labor-intensive process so we will need at least 24-hours to create your design. The minimum order is 25 garments. Embroidery is a wonderful option especially for several of our most popular outerwear items like caps, beanies and sweaters. We use thousands of vibrant threads to create your unique design on the apparel that best suits your needs. Thee minimum order for embroidery is 25 garments. A heat transfer is the ideal method for printing customized names and numbers on mesh or polyester based outerwear. The minimum order is 25 garments.